Dell has revealed a suite of holiday wish-list worthy devices and services that provide the most immersive and comprehensive computing experience available. The new offerings include the new Inspiron 13 7000 2-in-1 and laptops with new 8th Generation Intel Core processors; performance enhancements to the critically acclaimed XPS 13, Dell Visor Windows Mixed Reality Headset, and Premium Support Plus service. These new innovations demonstrate Dell’s commitment to providing the best audio and visual computing, virtual reality (VR) and gaming experiences for consumers. Dell’s new top-tier Premium Support Plus ups the ante to deliver the most comprehensive support service available for consumer and gaming PCs. Premium Support Plus builds on the great features customers have come to enjoy with Dell’s Premium Support such as 24/7 phone support, onsite service after remote diagnosis and hardware and software support. Powered by Dell’s exclusive SupportAssist technology, it is the first and only consumer service to proactively find issues, predict problems before they start, automatically remove viruses and optimise performance for consumer PCs. This service also comes with many advanced support features like repairs for accidental damage. The automated proactive, predictive capabilities have been tested and proven in the commercial market and now Dell is bringing them to consumers. Customers can tailor the experience to their lifestyle – a hands off, call-free experience with automated integrated support or one-on-one personalised support with an agent or a combination of both. Customers experience up to 88 percent less time to issue resolution and up to 77 percent fewer steps in the support process when compared to other premium service offers. Available from August 29 in the UK for Dell Inspiron, XPS and Alienware systems. Designed for the mobile multi-tasker or multi-user household, the new Inspiron 13 7000 2-in-1, Era Gray brushed aluminium, brings stunning visuals and powerful performance in a smaller footprint than the previous generation. Enjoy a beautiful visual experience with a narrow border and FHD IPS touch display and an optional 4K UHD IPS touch display that covers 100 percent AdobeRGB. With the Inspiron 7000 2-in-1, watch movies or video chat uninterrupted thanks to SmartByte streaming technology co-engineered by Dell that prioritises streaming and conferencing above other network activities. Experience exceptional performance and immersive experiences with new 8th Generation Intel processors, DDR4 memory; and flexible connectivity options with USB Type-C with support for DisplayPort and Power Delivery. The Inspiron 7000 2-in-1 also offers longer battery life and quieter performance with standard SSDs or optional PCIe NVMe SSDs. 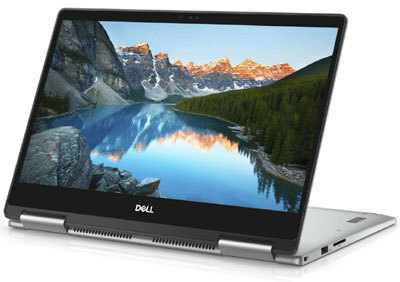 Available in the UK from August 31st starting at £949 on Dell.co.uk and available at select retailers from mid-October. The new Inspiron 7000 laptops are the perfect travel companion with the slim, light and thin-bezel design in Platinum Silver or Pink Champagne. Available in 13 and 15 inches, the Inspiron 7000 offers a brilliant FHD IPS display for a crisp, detailed picture, with a UHD option that covers 100 percent AdobeRGB available on 15 inch model. The laptops take advantage of the outstanding performance, responsiveness and hardware enabled security built into the 8th Generation Intel Core processor, as well as strengthened security with password-free biometrics login with Windows Hello and infrared camera or fingerprint reader (on 13” only). Finally, it offers a range of storage options including PCIe NVMe SSD. Available in UK from August 31st. Dell has also updated the Inspiron 13 and 15 5000 2-in-1s, which offers supercharged performance in a super thin design, and the Inspiron 17 7000 2-in-1, the complete package in a flexible form factor. These systems now offer new 8th Generation Intel Core processors and DDR4 memory for exceptional performance when multi-tasking. The Inspiron 13 and 15 5000 2-in-1 are available in EMEA from August 31st starting at £749 and Inspiron 17 7000 2-in-1 is available in EMEA from August 31st starting at £949 on Dell.com. Inspiron 17 7000 2-in-1 will also be available at select Retail Partners from mid-October. Carrying the tradition of delivering the best computing experience the XPS 13 now offers up to 44 percent more performance with the latest 8th Generation Intel Core i7 processors and Dynamic Power Mode7. With the new 8th Generation processors, with four cores versus two, experiencing exceptional performance while multi-tasking and running multiple applications is possible. The XPS 13, the smallest 13.3 inch laptop on the planet8, also boasts a stunning viewing experience with optional Quad HD+ InfinityEdge (optional touch) display, with sharp visuals and vivid and accurate colour. It’s no wonder it’s Dell’s most award-winning laptop ever. XPS 13 with 8th Gen Intel Core i7 will be available in the U.K. starting September 12 for £1,199, with additional configurations available in October. As a driving force in the virtual reality space, Dell has developed one of the broadest portfolio of VR-ready devices – notebooks, desktops, mini-PCs and AIOs – and end-to-end VR solutions, from creation to consumption to storage. In partnership with Microsoft, Dell blazes into the mixed reality future with the sleek and comfortable Dell Visor - its first-ever virtual reality headset for the Windows Mixed Reality Platform. Engineered with a flip-up visor for convenient transitions, it features well-cushioned head and face padding, thumbwheel band adjustment for personalised comfort, and smart weight balancing that takes pressure off the nose and cheeks. The white finish is easy to clean and durable, and the thoughtful design extends to cable management that routes cords to the back of the headset for better freedom of movement. Dell Visor takes advantage of the same technology used in the Microsoft HoloLens, including inside-out tracking cameras, with a 360 degree panoramic view. The headset itself able to scan surroundings instead of satellite emitters positioned inside the room. Its future-proof tech extends to platform-agnostic communication, with the possibility of users interacting with owners of different MR headset brands down the road. Dell Visor Controllers offer complete flexibility with six degrees of freedom of movement in a three-dimensional space. The Controllers allow users total control with haptic feedback, thumb stick and buttons fully tracked by sensors in the headset. Available in the UK in the coming months for £349.99 (headset) and £99.99 (controllers) on Dell.com.